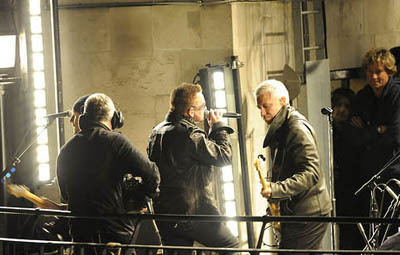 U2 > News > 'Boots' Over London. Get On Your Boots, Magnificent, Vertigo and Beautiful Day rang out across the rooftops on a beautifully clear winters night as the police closed Portland Place in Westminster to keep traffic away so that the crowds massing on the streets below could enjoy the free show. Only the BBC would have film of the set from their own helicopter - looks great too, watch it here. 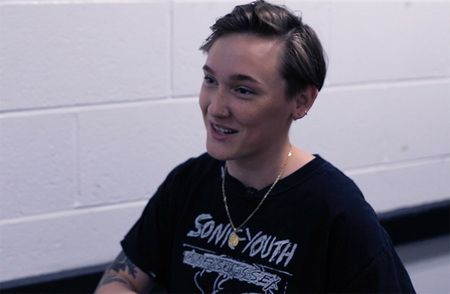 The impromptu gig was the climax of a great day at the BBC which began with a performance in the BBC Theatre for Radio 1's Live Lounge ('Boots', Magnificent, Beautiful Day and Breathe), segued through myriad studio interviews and ended up with the live set for Chris Evans' Radio 2 show. Little chance of that as people craned out of local hotel windows, waved from surrounding balconies and even stood on the roof of the nearby church to get a better view - periodically taking sharp intakes of breath anytime they felt the singer was getting a little too close to railings. Amazing job by the band's crew to set up the gear in such a miniature roof space and hang the PA off the building so that the sound was so clear in the middle of London. Great end to a great week in London. Are you in the UK and were you there tonight ? Leave us a comment, tell us what it was like. I heard the romours, and as I am working nearby, I thought I drop by after work, in the end I had to leave a little earlier, as I could not conceil my excitement any longer! great to see them again, what a day, and only U2 can make a distance between the road and the 7th floor feel small. Well done, everyone, thanks the Metropolitan police - and looking forward to the tour! Have been a fan for years and never been able to see them live. That all changed when I won tickets to see them in live lounge. One of the best days of my live. The sound was amazing !!!!!! Belgium was in the video! I work at BBC World Service,our studio is next toBroadcasting Houseroof, so we decided to have U2 instead of the news. Not a bad choice! Amazing - so glad I dragged myself up there despite being ill - was worth it!!! Has made me desperate for more though! They are heading to the NYC today as they will be on Letterman all next week... It is anybody's guess what they will pull out of the bag while in their favorite town. my brasilians`friends were There !! My friends from Brazil were there it`s amazing! They don`t believe until now !! I only saw on BBC ...... I loved....i loved....i loved !!! Magnificent live was beautiful !!! 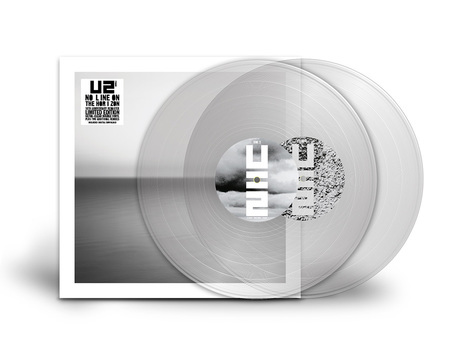 Thanks U2 for this gift !!! ihe show was amazing!!!! An unforgettable night!!! We got our brazilians flag autographed by Bono, Edge and Adam...just Larry is missing. 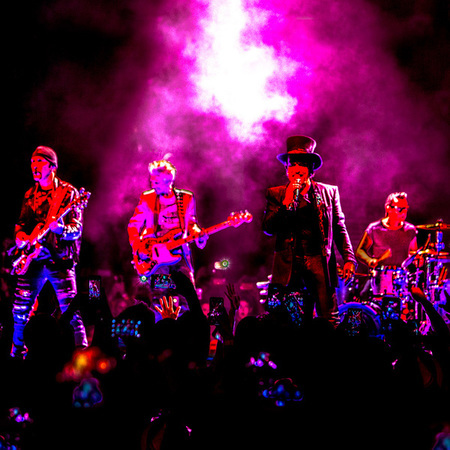 Just U2 can do something thing like that. The greatest band ever. Great way to finish the week. Brilliant Friday night in London. Sound amazing...well done guys, can't wait for the album!!! I heard the rumours too, got down there for about 5 and already the area was buzzing with excitement - eventhough quite a few people didn't know what it was about. Everyone was just standing around looking up at the building.People onopen top buses looked intrigued. 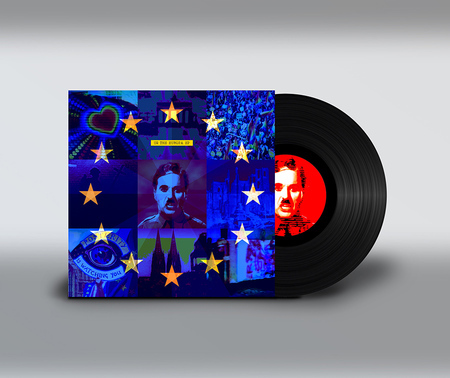 Then the road was shut off, and we all poured onto the road, I was near the church.Then Chris Evans announced 'U2', and we were treated to the four songs whch vibrated all the way up Regent Street. Magnificent! it was my first time seeing u2 live. It was good. Wasn't awesome probably due to the sound quality, but as it wasn't a proper gig I was very, very pleased anyway. Well done guys! I was there. It was awesome. 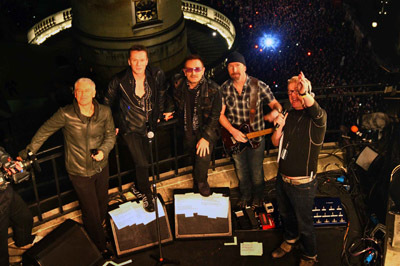 I thought Bono was going to fall over the railings at one point. Great to hear 'Magnificent' blasting into Oxford Circus. A special moment for fans. Thanks! I was there and the whole experience was really breathtaking and surreal! I have been following the band around the globe for 20 years now. I just missed out on the brooklyn bridge / ABOY video shoot by days as i flew back to england - but this one i knew about and got myself in the front row right outside broadcasting house. The atmosphere was electric and the boys were on top form - magnificent. Roll on letterman and GMA!! I was at the gig last night! it was amazing!! i was dancing and singing all the way through! well done boys!! An awesome show it was too! I was there,,,and I met the band! We were very aware of U2's presence in London and on the BBC this week. 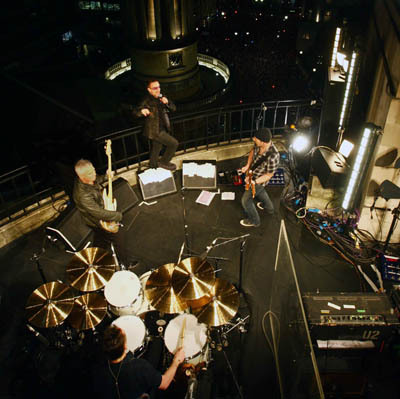 You should never let the truth get in the way of a good story, but U2 performing live on the roof of the BBC was the truth, a great story, and a generous gift to us lucky enough to be there. From the front of the crowd, the gig tonight was awesome and never has Vertigo been a more pertinent song! Was there tonight had waited around for a couple of hours so got near the front but thought the sound was a little bitoff but as always great show. Love'Magnificent' what a great song!!!! !